My last post Party On!, was all about tips for planning a party, and specifically a cocktail and heavy hors d’oeuvres party. Now comes the fun part…the food and drink! So this post will be short on chat and long on recipes. If you missed the first two items on my party menu, the Retro Cheese Olive Bites and the Bacon Wrapped Dates with Apricot and Pistachio, click on the names to link to those recipes and the last post. Another great recipe from the party is this Caramelized Shallot and Blue Cheese Dip from Bon Appétit that’s a tried and true favorite I’ve used for years, and it’s great with crudités as well as potato chips. Following are the rest of the party recipes, some or all of which I hope you’ll consider for your next entertaining event. And be sure not to miss the cocktails at the end of this post…got to have the festive drinks to go with the hors d’oeuvres, after all! The flavor of the chicken salad is even better the day after it’s made and once the tarragon has had a chance to blend with the other flavors. Preheat the oven to 375 degrees F, place the chicken breasts in an ovenproof casserole that has been greased with olive oil, then drizzle 1 Tablespoon of olive oil over the chicken. Sprinkle with a pinch of kosher salt and freshly ground black pepper. Bake the chicken breasts in the oven until just done and the juices run clear when sliced, about 35 minutes. Remove from the oven, cover with foil and allow the chicken to rest for 10 minutes, uncover and cool. Remove the skin and discard, and remove the meat from the bones. Chop the meat into small pieces, about 1/2 inch, and place in a large bowl. Add the remaining ingredients to the chicken, then stir until everything is well mixed and the mayonnaise has coated all the ingredients. Cover and refrigerate the salad until ready to use. It will keep for up to two days in the fridge. About an hour before you’re ready to compose your crostini, use the biscuit cutter to cut out rounds of brioche, avoiding the brown crusts. You’ll get 2 rounds, sometimes 3 out of each slice depending on how large your brioche loaf is. (I save the crusts and leftover bread, freeze it and make bread pudding, or breadcrumbs.) Spread the rounds on a cookie sheet and toast them under the broiler until lightly golden brown on both sides. Remove from the oven and allow to cool on wire racks. 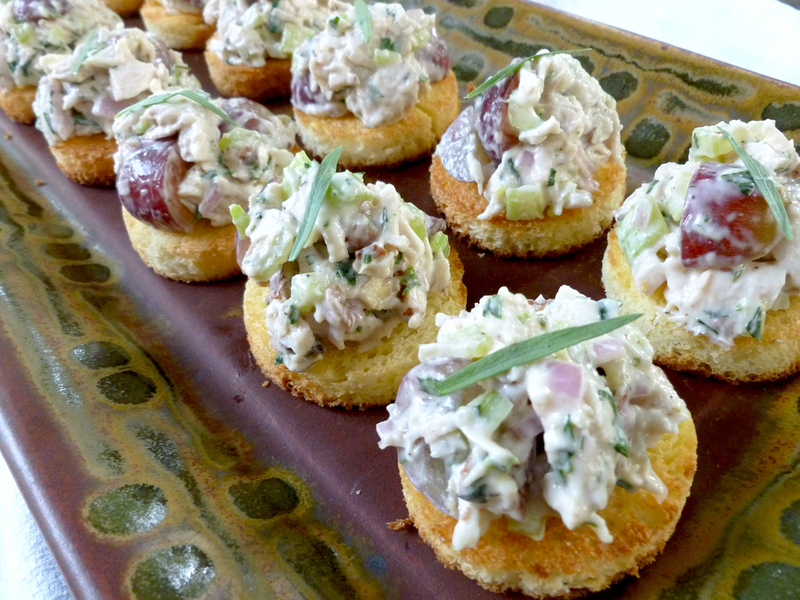 Mound about 1 heaping tablespoon of chicken salad on top of each crostini and garnish with a fresh tarragon leaf, if desired. It’s hard to stop at three of these lovely little bites. Using a sharp or serrated knife, slice off a tiny sliver on the bottom of each tomato so it will sit without rolling, then slice off the top of each tomato and gently scoop out the seeds and centers of each one. Turn them upside down on a paper towel as you go to drain. Refrigerate if not using immediately, for up to one day, sitting in a deep dish on paper towels and covered with plastic wrap. When ready to stuff, combine the goat cheese and basil in a small bowl, mixing well. Taste and add a tiny pinch of salt and pepper if desired, but I like mine plain. 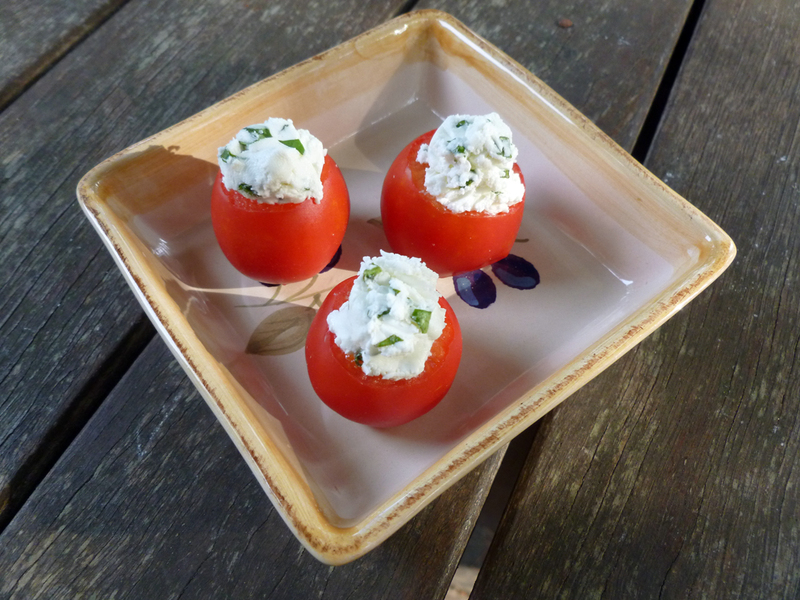 Stuff a small amount of the goat cheese mixture into each hollowed out tomato, mounding slightly on top. Keep cool until ready to serve. …and after frying, ready for aioli and eating…or freezing! Whisk the first 7 ingredients together in a medium bowl. Gently fold in the crabmeat. Stir in 3/4 cup of panko, 1 1/2 Tablespoons of chives, salt and pepper. Form a scant tablespoon of the crabmeat mixture into a ball. 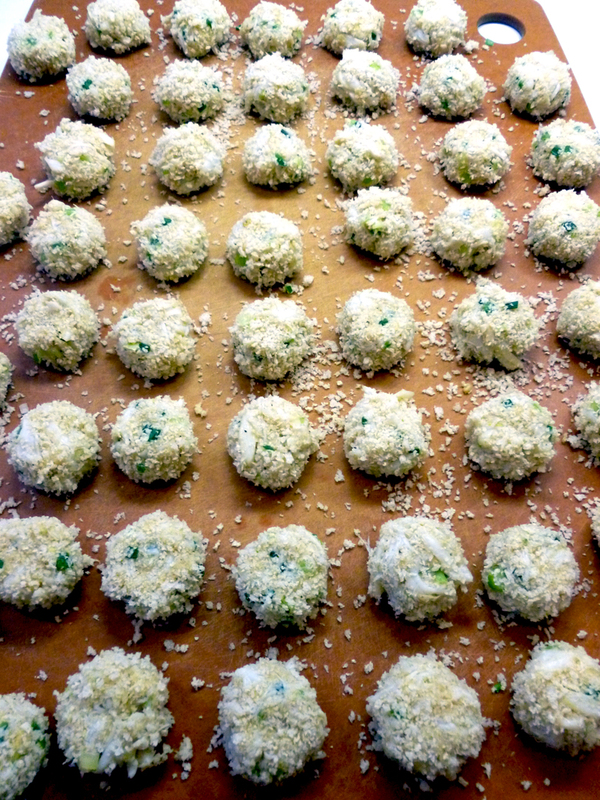 Roll in the remaining 3/4 cup panko crumbs, set on a parchment lined cookie sheet, and very lightly pat the top to make it flat like a crab cake. Repeat with the remaining crab mixture and panko. In a large non-stick skillet, heat 3 tablespoons of olive oil over medium heat. Add crab cakes in batches, do not crowd the pan. Fry until golden brown and crisp, about 3 minutes per side. Remove the finished crab cakes from heat and drain on paper towels. Repeat until all of the crab cakes are cooked. If needed, add one more Tablespoon of oil during the frying process. If serving right away, proceed to instructions for the aioli. If freezing, place the crab cakes on a cookie sheet in the freezer uncovered until firm, then transfer to an airtight container and freeze until ready to use, up to 6 weeks. 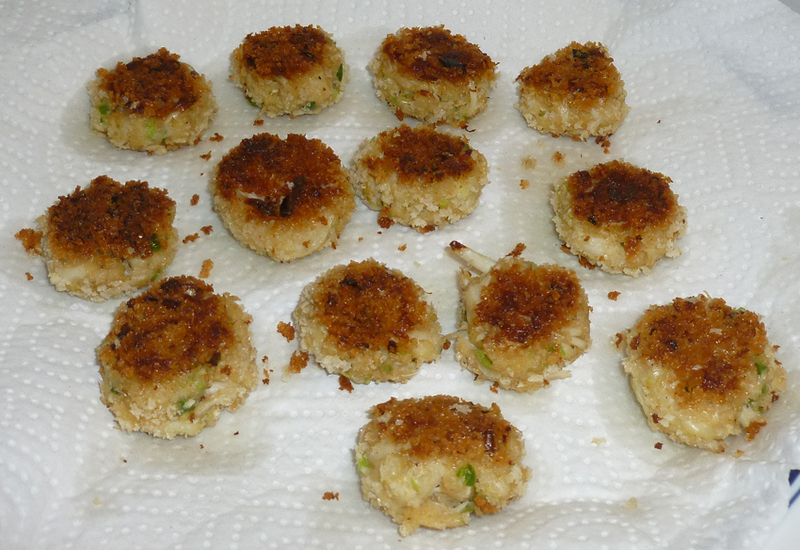 To serve frozen crab cakes, preheat the oven to 425 degrees F. Place the crab cakes on an un-greased cookie sheet, and bake until heated through, about 10 to 14 minutes. While the cakes are warming, mix together all ingredients for the aioli in a small bowl. Place the cakes on your serving platter and top each one with a tiny dollop (about 1/4 teaspoon) of the aioli. Scatter chives across the platter for garnish. 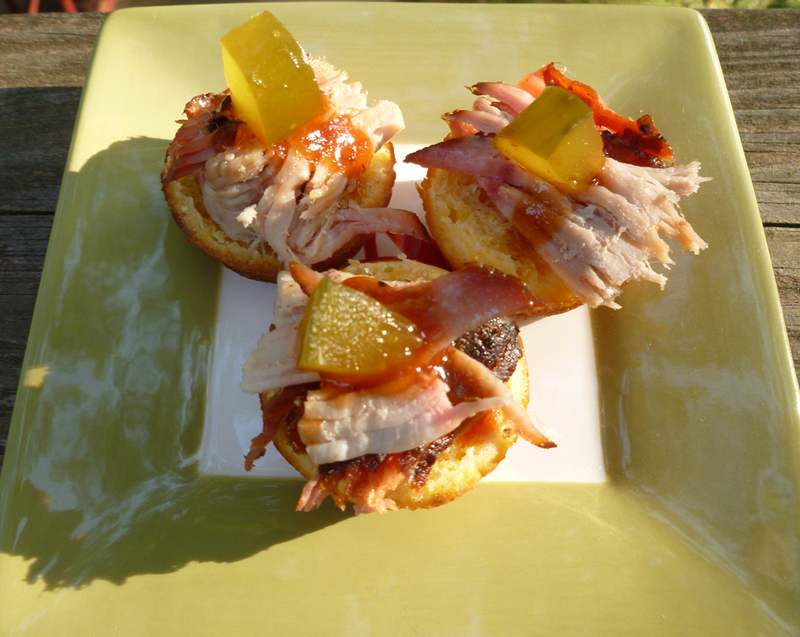 Pulled pork, Wickle and cornbread…a classic southern combo. For the tartlets, preheat the oven to 375 degrees F. Butter two 24-cup mini muffin pans, or you can use just one and bake in two batches. In a medium bowl, whisk the cornmeal with the flour, sugar baking powder and salt. In a separate small bowl, combine the eggs, milk and butter. Add the wet mixture to the dry mixture and stir just to combine, don’t overmix. Spoon the batter into the muffin cups, filling them halfway. Bake for 10 minutes or until golden. Cool in the pans for 10 minutes and then turn out to cool completely. If you’re not using the tartlets immediately once they’ve cooled and plan to freeze them, freeze before slicing off the domes. Thaw and bring back to room temperature before using, then slice off the domed tops of the muffins to make a flat surface. Place the pork on a plate and douse the pork with the spicy North Carolina barbecue sauce, allowing it to absorb the sauce. Top each tartlet with some pork, then drizzle a few drops of the sweet sauce over the pork and top the tartlet with a Wickle. Serve at room temperature. And the drinks! Each recipe makes one cocktail. Cheers! The Classic Champagne Cocktail is my favorite of the three! Soak the sugar cube in Angostura bitters, drop it into a champagne flute and top with champagne. Serve. The color change in the layers of the Kir Royale are so subtle, they are hard to photograph. But in this shot you can see that whatever this drink is, it’s a pretty color in candlelight! Pour the champagne into a flute. Allow it to settle for a moment. Gently pour the cassis down the inside of the glass through the champagne. The Kir should have a layer of cassis at the bottom. Garnish with a lemon twist or with a blackberry if desired. 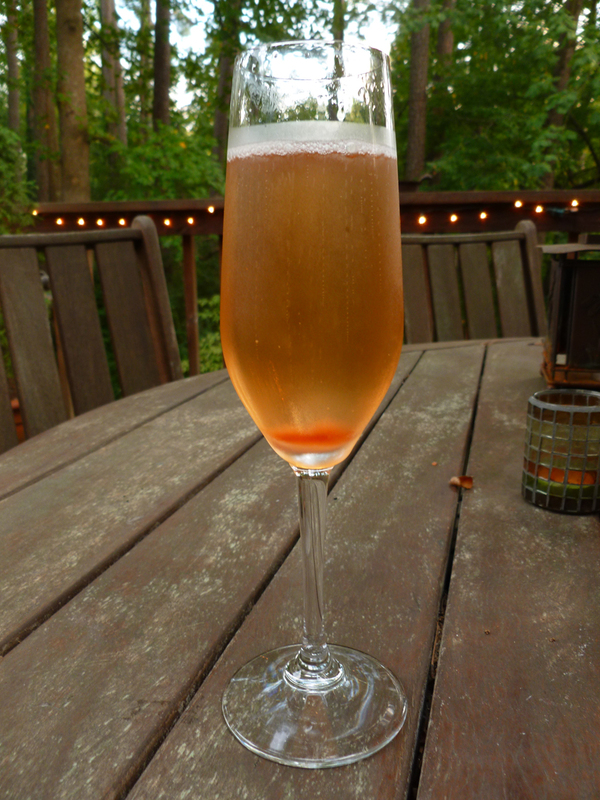 The Italian Spritzer is usually made with Prosecco, but we made ours with champagne…it’s great either way! 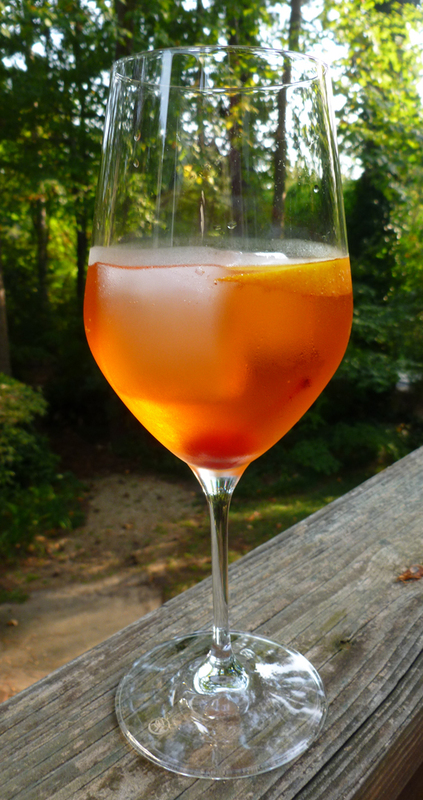 Pour the Aperol into a large wine glass with ice cubes (we use two large ice cubes), then add the champagne and splash of soda. Garnish with an orange slice or a cherry, or both. This entry was posted in Food and tagged Appetizers, champagne cocktails, chicken salad, Cocktails, cornbread pork tartlets, Easy recipes, goat cheese stuffed tomatoes, hors d'oeruvres, mini crab cakes, party food, Tarragon Chicken Salad by bitsandbreadcrumbs. Bookmark the permalink. I really appreciate your freezing directions! I want to come to your house for a party for sure! When’s the next one…? 🙂 LOVE the chicken salad on little brioche rounds. Beautiful and delicious…so perfect for bite sized delight. Hi Geni, and thank you for your sweet compliments! 🙂 As soon as I recover from this party, I will let you know when the next one is! 😉 I’ve never been huge on freezing, but this party absolutely necessitated freezing some items…and now that I’ve done it, I don’t know why I was hesitant. Of course, some things freeze better than others. That chicken salad is good by itself, on brioche, regular bread or atop greens. I’m a big fan of a good chicken salad. Sure! All I need it a ticket to Australia and a place to stay, and I’m there! 😉 Thanks, CCU! Last night in Paris but I wanted to get a word (or two) in… Your party food looks amazing! Thanks and lucky you, Eva, and I can’t wait to hear about your trip. We’ve been camping in the mountains and once again had no internet for the last three days. Fun, but quite different from Paris! Everything looks amazing. I will start with one of each, please. Don’t look when I go for seconds. The Classic Champagne Cocktail is my favorite too. Those crab cakes… om-nom! 😀 That looks so wonderful, all of it. That champagne spritzer especially refreshing. Love the view behind the glass too! Looks a wonderful place to sit and enjoy drinks with friends! William is fine – thank you for asking! And… if that is your deck then damn I’m jealous!!!!! I want your house! Definitely going to try my hand at those crab cakes! They are great made larger for dinner, too! Incredible, Betsy! Everything looks so appetizing. Even with making things ahead of time, you must run a very organized kitchen. I’m in awe and need one of those cocktails to calm myself. Do they ship well? Well, I wish my kitchen was that organized…it’s so small it can’t be! But I did start making some things about two weeks out, and that was my saving grace. But thanks for the compliment, it’s a nice idea. Now, let me see about shipping you a cocktail…which one would you like, sir? I like encore performances…thanks for sharing the recipes. You’re very welcome, Karen. I hope you enjoyed them! Have a great weekend Betsy! Hi Jed, and thanks. We’ve been camping all weekend, and had some more of that pork…it’s made by Community BBQ here in Decatur, GA, and it is MIGHTY good! 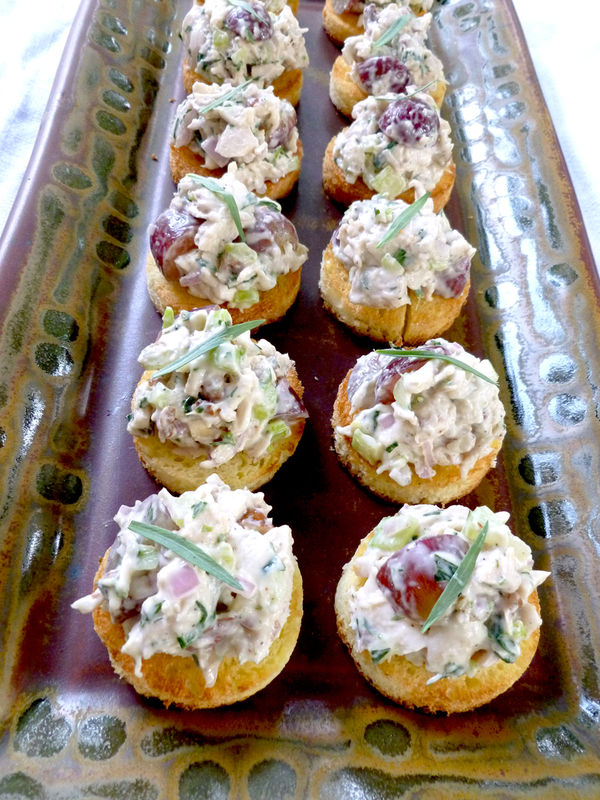 Hard to beat the chicken salad…lots of my fave ingredients! Hope you’ve had a good weekend. I’ll be playing catch up tomorrow. It was a lovely day, Ali, thank you. We all had a great time and ate too much! Cheers Betsy !! Lovely food, the crab cakes sounds absolutely delicious, in fact so delicious I think I’d snaffle the whole plate !! But can I ask what is Old Bay Seasoning? I want to come to this party, Betsy! I love champagne cocktails and every snack looks good. I substitute yogurt for mayo in creamy things but otherwise I’d be tempted to make your food as is. Hi Sharyn, and thank you! Well, next time, you’re invited! 🙂 I’ve made this chicken salad with a yogurt/mayo mix and it works just fine, so I imagine straight yogurt would be good, too! I’d be back and forth between the crab cakes and the Cornbread Tartlets with BBQ Pork, Sauce and Wickle . . . oooooooh, they look so good. Now, for the drinks — one of each please! Wow!! Wish I could attend one of your parties… Every single one of these dishes looks incredible! I want to try them all!! i have a blog of italian dish but i like change new flavors…. 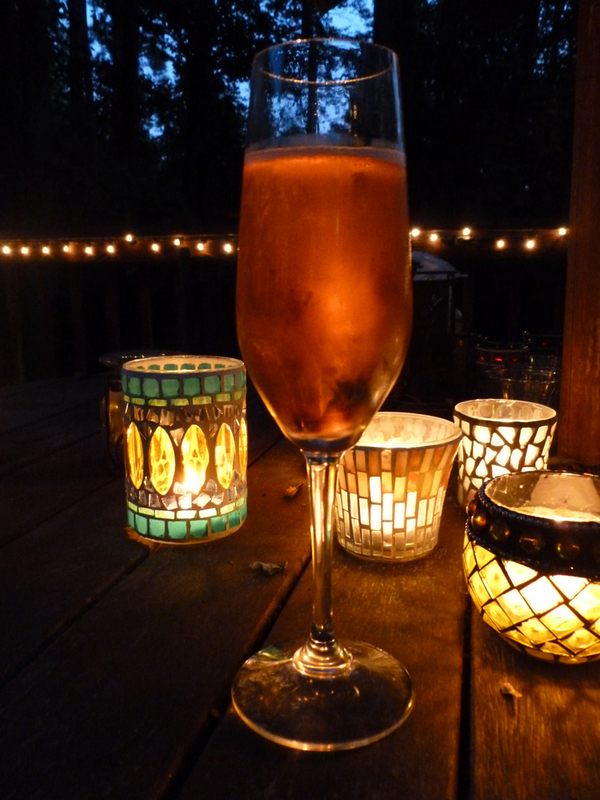 and you have given me some good ideas..
For the Italian spritz I suggest you use Prosecco not champagne…. this is the original. A truly wonderful blog post, so helpful and so inspiring. I think far too many of us buy our party nibbles in from the nicer supermarkets, articles like this show us how easy it is to do things ourselves. Loved the crab cakes and the tomatoes. Thank you Hamilton Courtney, and I apologize for the delayed response…you were in my spam folder waiting to be released! 😉 I’m so happy you enjoyed this post and hope that it really will be helpful. And I do agree that with only slightly more effort you can make great party nibbles on your own. Damn… I thought I threw a great party but this is AWESOME !! What wonderful recipes! You are so kind! 🙂 I’m glad you like these recipes. They are all pretty great if I do say so myself. I look back and can’t believe I made all of this at once for this party!